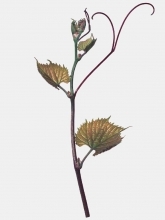 This variety is derived from the crossbreeding of Vitis riparia and Vitis berlandieri. - light to dark brown vine shoots. 161-49 C demonstrates a high tolerance against radicicolae phylloxera but with moderate resistance to Meloidogyne incognita nematodes. It is susceptible to Meloidogyne arenaria. 161-49 C resists up to 40% total limestone, 25% of active limestone and a CPI of 50. 161-49 C drought resistance is moderate to good. This rootstock is very susceptible to thyllosis, particularly when the plants are young, which may give rise to cases of harmful dry out. This rootstock is likewise susceptible to temporary excess humidity in the spring. 161-49 C is well adapted to limestone and clay limestone soils, not very compact, light and fairly deep. Soil which is too compact should be avoided. Over the last couple years, cases of dieback of grafted plants on 161-49 C have been reported. Southern regions would appear to be the most concerned, but plots presenting problems have likewise been reported in other regions. Initial symptoms (substantial decrease in vigor) most often occur from the third year after being planted. Cambium failure is generally observed on plants affected by an abnormal trunk and root thickening. Research is being conducted to better understand this phenomen, which has appeared under certain soil and climate conditions of this rootstock. Until the real causes of this syndrome are understand, great care is recommended when selecting this rootstock. The 161-49 C growth and fruiting speed is somewhat slow. In addition, the limited yields in the first years enable reducing the risks of thyllosis. This rootstock has moderate vigor with balanced vegetative growth. Quality products are produced from this rootstock and blends made with Chardonnay B, Colombard B, Merlot N, Pinot noir N and Ugni blanc B are particularly appreciated. It likewise produces good results with interspecific producer hybrids. However, some blending problems have sometimes been reported with Carignan N, Gamay N and Servant B. 161-49 C is a moderate wood producer (30 000 to 60 000 m/ha) with sometimes a certain proportion of damaged wood. 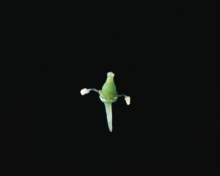 Propagation by cuttings is difficult due to subtantial presence of tendrils. The cutting and grafting capacity of 161-49 C is just moderate. Wood must be maintained under good conditions. Special attention needs to be paid with this root stock during the stratification phase (duration, hormoning) up until planting in the nursery. 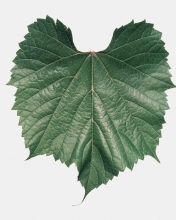 161-49 C is moderately susceptible to gallicolae phylloxera and demonstrates a high resistance to downy mildew. The 10 approved 161-49 C clones carry the numbers 170, 171, 176, 177, 190, 197, 198, 199, 225 and 239.